The Altar Guild is responsible for preparing the church for all services. Four volunteer teams of four or more members work one Saturday each month maintaining the linens, silver and brass; changing the hymn boards and hangings; and preparing the altars. Team members reset the altars in between services on Sunday. Each member of the Christ Church Altar Guild is also a member of the Diocesan Altar Guild. Serving on the Altar Guild is a wonderful way to work behind the scenes while enjoying the fellowship of other parishioners. Acolytes assist the clergy in conducting services of worship at Christ Church. Acolytes serve as crucifers, torch and flag bearers, and holders of the Gospel Book during the reading. We welcome both youth and adults. Most acolytes are scheduled to serve at Sunday worship services once a month, although acolytes who are not scheduled are welcome to assist because there is always something to do. 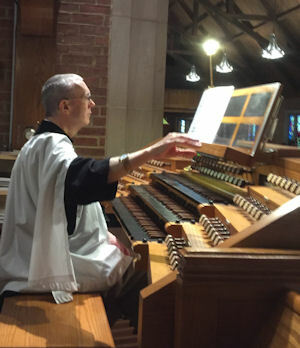 Serving as an acolyte gives you an opportunity to learn more about worship in the Episcopal Church and, at the same, take an active role in the service. 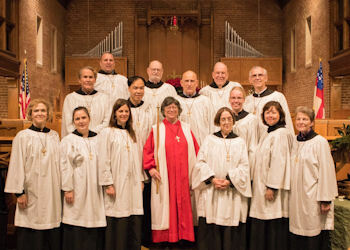 The Christ Church parish choir sings at the 10:00 a.m. Sunday service weekly (except during the month of August), as well as at some special services including the Community Thanksgiving Service, Christmas Eve, Maundy Thursday, and the Easter Vigil. The choir’s repertoire includes every genre of sacred choral music from Gregorian chant to contemporary compositions. Rehearsals are usually held in the choir room on Wednesday evenings from 7:30 to 9:15, and on Sunday mornings from 9:00 to 9:45 during the normal choir season (the Sunday following Labor Day through Trinity Sunday). During June and July the choir rehearses only on Sunday mornings in the choir room from 9 to 9:45. Visitors and newcomers are always most welcome! For more information, please contact Dr. Teddy Guerrant (email). The Flower Guild creates the beautiful floral displays that adorn the altar and other areas of the church. Two alternating teams of arrangers meet in the Flower Room (next to the Sacristy on the Franklin Avenue side of the church) on Saturdays from 9:30 AM until noon to create the arrangements. 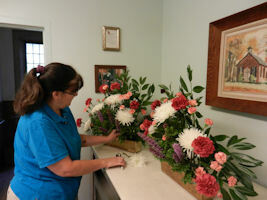 Some guild members are trained in the art of flower arranging but many learn on the job. The Flower Guild also provides the special Christmas, Easter and Thanksgiving decorations. Following the Sunday services, the flowers are delivered by the Usher Group to housebound members of the parish. Through the laying on of hands, the Healing Minister provides a blessing to any person wishing to ask for Christ’s help specifically for the healing of their own mind, body and/or spirit or of a loved one. Healing Ministers receive training in how to let God’s gift of healing flow through them. The Healing Ministry is available at all services following Holy Eucharist at designated locations in the Sanctuary that are announced at each service. Contact the Rector if you have an interest in this ministry. Eucharistic Ministers (Chalicists) assist the clergy by administering the elements during the celebration of Holy Eucharist. A brief formal training is required, and chalicists are licensed by the bishop on the recommendation of the Rector. At Christ Church, chalicists serve approximately once every six weeks. Lectors assist the clergy by reading the lessons that precede the gospel and leading the prayers of the people. Adults and young people who read well are encouraged to join this ministry. It’s a great opportunity to participate in the service. The frequency of service varies. If you are interested in either of these ministries, ask one of the vergers for more information. This program allows designated members of the congregation to deliver consecrated Eucharist to parishioners who are unable to attend our church services. 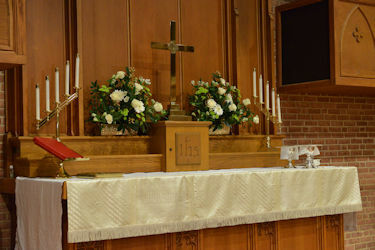 Weekly, kits containing the Eucharist elements are blessed at the altar and given to pairs of parishioners at the conclusion of the Holy Eucharist portion of Sunday services. The team then takes the kit to ill or housebound parishioners. One member of each team is specially trained to administer the Holy Eucharist off-site; however, anyone is eligible to be on a team. Serving in this ministry provides a wonderful opportunity to connect with fellow parishioners and make them feel part of our church community even if they cannot attend services. Volunteers for this ministry are generally scheduled every six weeks. Each service at Christ Church is staffed by Ushers. Designated ushers welcome parishioners, guests and visitors when they enter the church. They distribute service bulletins, and collect and present the offering from the congregation at the altar to support God’s work. In addition, they assist the congregation to and from the altar for Communion and straighten up the pews after each service. A wedding is a special day for the bride and groom, and solid planning ensures a smooth and memorable event. At Christ Church, a wedding coordinator works with the couple and minister to carry out a plan that minimizes the potential for mishaps and maximizes the beauty of the church and ceremony. The assigned coordinator meets with the couple to discuss the church set-up and help them comply with church rules and forms. The coordinator prepares the church for the ceremony and attends both the rehearsal and service to assist where necessary and clean up. This ministry is a wonderful way to participate in joyous church occasions and is much appreciated by the wedding couple and their families. Coordinators are called on several times during the year.